The F1 Smart is Life Fitness' entry level model, bringing a gym quality treadmill to the home at an affordable price. Compact and foldable, it's a solid machine that will last for years even with regular usage. The Life Fitness F1 features an LCD display that shows your relevant workout information such as incline, speed, time, distance and calories. The Life Fitness F1 Smart treadmill has received great reviews, as it offers a way for consumers without a huge budget to get a commercial grade machine for their homes. It is the least expensive model in the series, starting at about $2200. Although it sounds like a lot of money, when you compare it to their top of the line Platinum Club model at $7000+ it's really not so bad. The F1 has the same high quality components and ergonomic design found in Life Fitness' health club models, but it's portable and can be folded up after your workout, making it ideal for smaller spaces. You can monitor your heart rate either through the contact grips or wirelessly with a chest strap for more accuracy. There's a Quick Start function that stores your preferences as well as your preferred incline levels. Life Fitness is known for their FlexDeck cushioning, which minimizes impact on your knees and joints, preventing injuries. Unlike the other treadmills, such as the uplevel F3 model, you don't get a choice of consoles here. But the basic console on the machine gives you everything you need for an enjoyable workout, including iPod connectivity for your music. There is also a very solid warranty, as there is on most Life Fitness treadmills, speaking to the confidence the company has in its products. Any negatives? Besides the fact that you can't choose your console, the motor is only 2.5 CHP and the deck only 55" long, so this one is more of a walking/jogging machine that a serious running machine. It's perfectly fine for general usage but if you are looking to run or there are multiple users, you might want to look at one of the non-folding models such as the T3. How Does the F1 Smart Compare to the Other Life Fitness Treadmills? As we mentioned, the Life Fitness F1 Smart treadmill is more of an entry level model, built for those on more of a budget and those looking for higher quality than the typical base model offers. It is one of only two folding treadmills that the company offers, so if you need something that folds up, it's either the F1 or the up-level F3. The F3 treadmill gives you two console choices, a stronger 3.0 CHP motor and a higher 350 lb. max weight capacity, so it is more of an advanced machine. 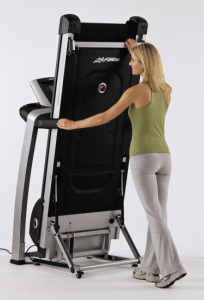 If you are going to be doing a little more than just walking and jogging, you should consider that machine as well. Compared to the non-folding Life Fitness treadmills, you notice even more of a difference between the base F1 Smart and the other machines. The T3 treadmill improves upon the F3 with a longer 20" x 60" deck and higher speeds up to 12 mph. The T5 treadmill gives you a wider 22" x 60" deck, plus advanced FlexDeck select cushioning, workout recall and an even higher 400 lb. max weight capacity. 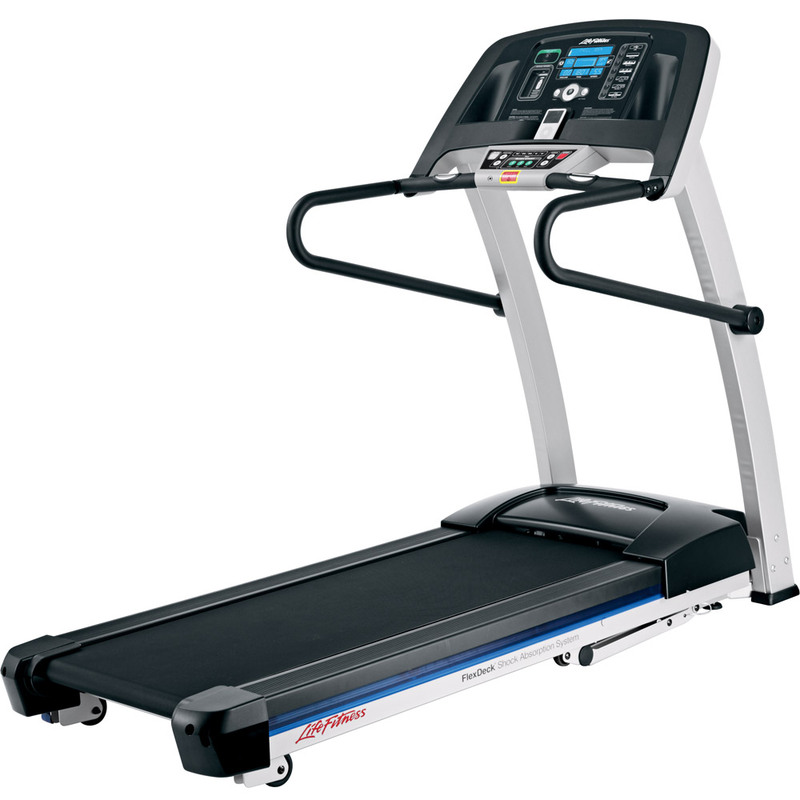 And finally the Club Series treadmills: base, + and Platinum, are even more commercial-grade and very similar to the machines you find in your health club...heavier and more durable with higher grade finishes than the F and T series models. So the benefits of the Life Fitness F1 treadmill are its more affordable price, its compact size and its folding capability. The drawbacks are its weaker motor, smaller running surface and lack of extras compared to the other models in the lineup. Should You Buy the Life Fitness F1? If you're reading this F1 Smart treadmill review, it's safe to say you are considering buying one for your home. If that is the case, we say by all means go for it. Just keep in mind that this is more of a starter's machine for basic use than a runner's machine. If you are planning to do some walking, some jogging, occasional running and it's just you or perhaps one other average size user, then the F1 Smart is a good choice for you. However, for more serious users, those who like to run a lot, taller/heavier users or multiple users in your home, you'd be better served with one of the more advanced Life Fitness treadmills. If that sounds like you, consider the up-level F3, which also folds, or one of the non-folding models. The T3 is similar to the F3 but gives you more room, and the T5 is the best choice in the non-folding series. 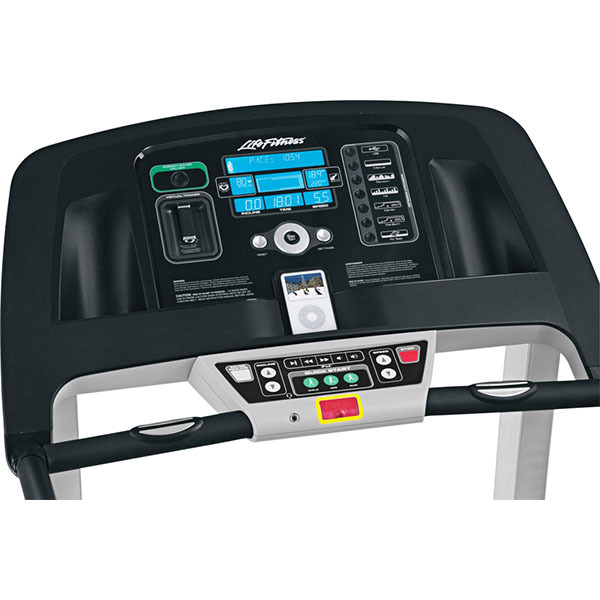 The Club Series treadmills are all rock-solid, but they are thousands of dollars more than the Life Fitness F1 and not worth the extra money, especially for light use. So for beginners, elderly, rehab and any other light use, the F1 will be perfectly fine. For anything more you're going to need one of the more advanced models. Life Fitness is definitely one of the leader's in the commercial and residential cardio machine market, and the F1 is just another example of the quality that the company puts out time and time again. You get folding capability, great cushioning, incline, a solid warranty and gym-quality components. For walks and jogs, and even basic runs, the F1 Smart is more than capable...for serious runners look at the T Series or even the Club if that's within your budget. Get the popular Life Fitness F1 on sale right now!